With new methods of hackers gaining access to your machine a new wave of virus is emerging. Going by the name of ransom ware. The clue is in the name, hackers infect your machine using various loop holes and security holes. Once infected it embeds itself in numerous places on the machine making it harder to remove. 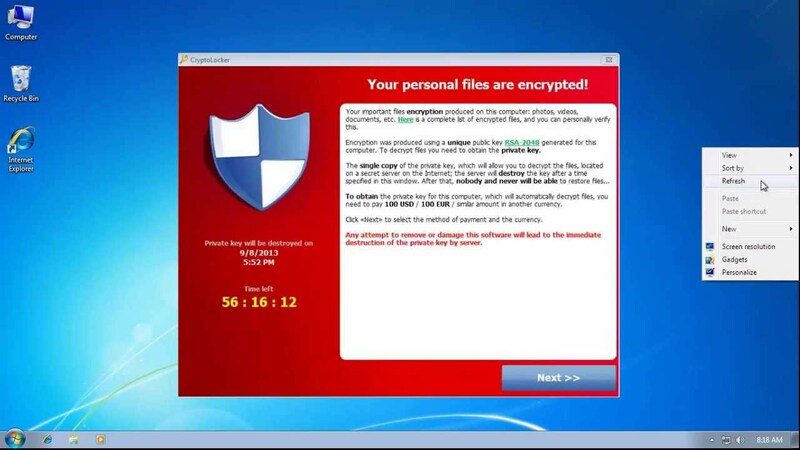 One example is CryptoLocker. Its infected via a email attachment on one of our client machines. It began to popup a warning message with a countdown timer to encrypt all documents and photos etc. If you do not pay $300, we know full well you do not remove it if you pay. It is illegal to do so to infect a users computer with out permission.